Warm sun, whispering wind, soft ground and the scent of flowers and greenery - in the exuberant leap of a rabbit is the joy of a spring morning. 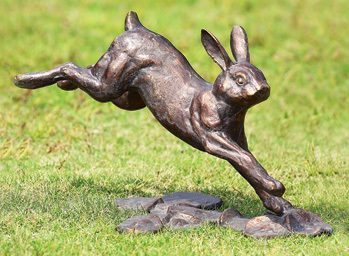 This sculpture captures the rabbit in mid-leap, expressing the wonder of being alive. Hefty cast iron with bronze finish; 15" long, 9 1/2" high. Gift wrap and rush delivery not available. Even better than I expected. Really heavy & beautiful. Great Shipping packing. Thanks!!! Beautiful craftsmanship. We don't have a lot of sculptures or decorations in our gardens, but at first sight in the catalog, I thought this sculpture would add a unique touch to a new garden we dug up this summer. Although the sculpture is immobile, the implied sense of dynamism and strength in the hopping rabbit's representation as it completes a leap is very graceful. And it is of course, very cute. I even love the way the bronze shines in the sun. It's not terribly heavy, but it seems sturdy enough to withstand blowing winds. Would have been nicer if it was a little less expensive, but it arrived on time in good condition and I love it--I'm glad I found it. There's just something tranquil about the sculpture when looking at it as well as looking at a real rabbit. We used to have quite a few rabbits in our garden; hopefully this might help bring them back, even if we have to wait till next season to find out. Would be interesting to see what they make of our new little friend.